A BUBBLING CAULDRON: What A Great Evening! 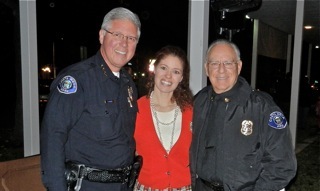 In a year which has seen the City of Costa Mesa in turmoil - with budget concerns causing new council members to initiate ill-advised and illegal schemes to outsource most city services and issue premature layoff notices to nearly half the staff and political opportunists attempting to re-construct city government - it looks like it might draw to a close with positive vibrations. 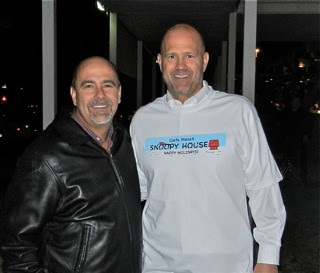 No city needed an event like Tuesday night's launch of the Snoopy House more than Costa Mesa. 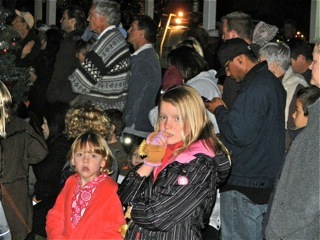 The weather cooperated by dispersing the clouds that had dropped a quarter inch of rain over the past couple days, leaving a crisp, cool and nearly perfect evening for the Grand Lighting of the City Hall and the launch of the Snoopy House - a 45-year-old tradition in Costa Mesa that seemed destined for the scrap heap only ten days ago. Jim Jordan and his wife tugged at our collective heartstrings as they expressed their gratitude to Hatch and other city officials for saving the Snoopy House display - a fixture on the lawn of their Eastside Costa Mesa home for more than four decades until the house got mired in financial distress and is in foreclosure. There were many other highlights last night. 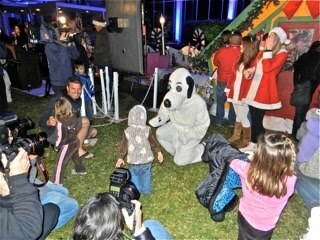 Snoopy was in attendance, thrilling the children who snuggled up to him. 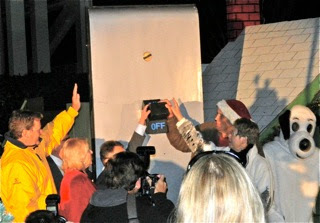 The arrival of Santa for the first of a dozen visits between now and December 23rd was a real treat. 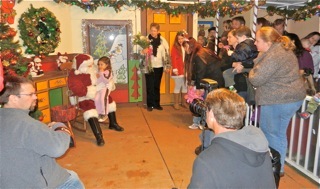 Kids with their parents lined up to perch on Santa's lap and tell him what they want for Christmas and to receive free photographs. And photographers squeezed together to capture those moments. 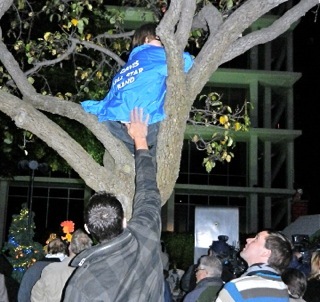 One young fella found the perfect vantage point for viewing the ceremonies. 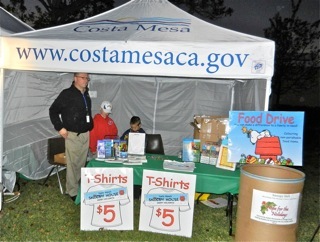 City staffers and other volunteers manned the booths to offer hot apple cider and peddle commemorative t-shirts. There was a ceremonial "flip of the switch", when the colorful illumination of City Hall itself created a breath-taking backdrop and all the lights and animation on the displays themselves jumped to life. The future of the Snoopy House display is unclear at this time, but for the next couple of weeks it will be on the lawn of City Hall for visitors to enjoy from 5-10 p.m. every evening from now through New Year's Eve. This event has received nationwide notoriety - I saw the Associated Press story in the Washington Post, for example. 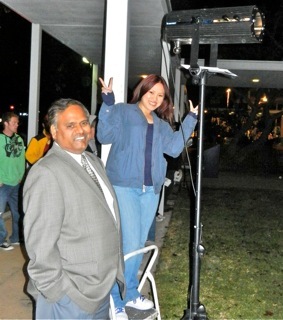 Print and electronic news media were on the scene last night, capturing the moment and interviewing folks. 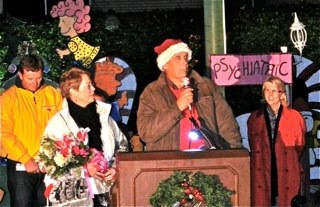 Thanks to Hatch, Bill Lobdell, Dan Joyce and all the tireless volunteers who managed to get the Snoopy House moved from the Eastside to City Hall and put it all together and get it running in time for the festivities last night. We, the residents of this city, needed that. I'm happy the city did this. Much needed spirit to the community and to the gentleman who ran upon hard times. Kudos to all involved !! 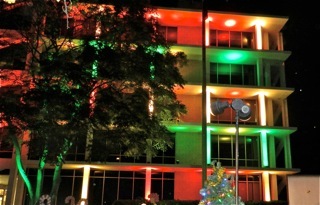 1. Who is paying for the electric bill for this display? If the City is - it is disturbing based on their financial status. 2. Staff time- Did the employees volunteer or were they paid using City funds? I saw one employee working the t-shirt booth, Dan Baker. 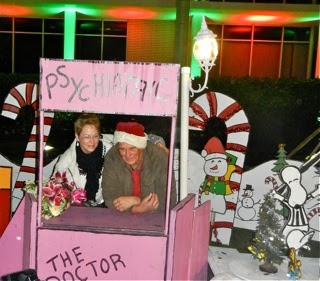 He is working in the City Manager's office; therefore, he is being paid over-time to work this display? Lobdell? He is sporting a t-shirt and working? Again, for $3K a week. 3. Speaking of good cheer; an employee who worked in Communications and took that horrific call the day Huy died lost her house and job- why didn't the City use all the money spent on this endeavor to donate to this employee? If I sound like sour grapes you are correct. I am disturbed that a City that proclaims it is broke is spending money left and right. I really enjoy your Blog. The way you wrote " Many thanks to Bill Lobdell, Dan Joyce and the many volunteers......" Kind of makes it sound like they are volunteers too....NOT! 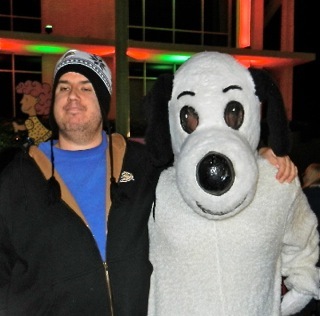 Monahan was able to get to city hall for Snoopy, but not when an employee died. Call Me Grinches: I am so glad I am not like you. 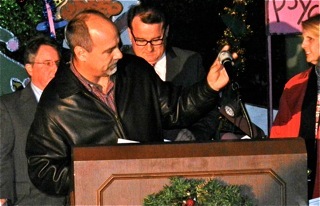 Most of the Councilmen only stayed a short time at this great City event, as they had to hurry over to a very nice, very political OCGOP Christmas party over at the Newport Country Club. Santa got up on the stage and pulled a few of our Councilmen up with him to tell everybody in attendance that they had been real good this year? Don't know about that... saw Wendy, Gary and Steve there until we left at about 6:45. No sign of Bever all night - not a bad thing. 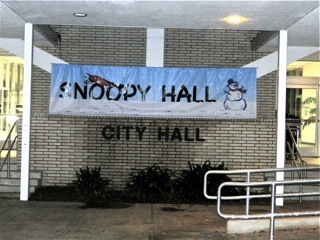 The city is paying the electric bill, and several on the clock city employees were needed to ensure camp snoopy was set up safely (building inspectors and maintenance staff) not to mention the press releases that had to be written and the time of Hatch and his administrative staff. But as long as a bunch of wooden peanuts cutouts have a home for the holidays that's all that matters..right? I'll be the first to admit, I am not the happiest with the phab 4. But, I think that in the end this is a good thing for the city. I dont care about the electric bill or if someone is getting paid. Its a city not a concentration camp. BTW... Word is Bever didnt show because it opened on a Tuesday. I have no issue with the Snoopy House being at City Hall, though I am suprised there are no copyright issues with the owners of the Peanuts trademark. It is one thing to have a display in a man's yard, but now they are now selling t-shirts and getting all kinds of media attention. Here is what Peanuts Worldwide LLC says regarding their copyright on "Peanuts"
No part of the PEANUTS materials may be copied, reproduced, used or performed in any form (graphic, electronic or mechanical, including photocopying, recording, taping or information storage and retrieval systems) for any purpose without the express written permission of PEANUTS © Peanuts Worldwide LLC. Would not surprise me if they bumbled another one with their usual hurry to screw things up. Whah, whah, whah-whah, whah.... Translation: "It's for the kids!" "without the express written permission of PEANUTS © Peanuts Worldwide LLC. Would not surprise me if they bumbled another one with their usual hurry to screw things up." "What, ME worry? Nah. That's for the little people. You haven't been paying attention- we have 2,000 attorneys with no cap on fees!" We have a $100 million budget in the city. Council Member says "You need to start paying for your pension and benefits". Fireman days " huh, I can't do that, I have contracts to pay for my big boat and a house at The River". Punch line ... " you have 3 years to sell your boat"
Based on the flawed logic presented here, Newport Beach should cancel the Boat Parade. Can you imagine taking away such an asset. If Riggy gets sued by Charlie Brown, Riggy may claim it's OK because we will soon be a Charter City and can do whatever the heck I want! It's my city and I run it!